Carbon monoxide detectors are now being required in most homes in California after the approval of the Carbon Monoxide Poisoning Prevention Act. California's Carbon Monoxide Poisoning Prevention Act of 2010 dictates that, starting on July 1, 2011, all residential property, from one to four units, must be equipped with approved carbon monoxide detector equipment. The equipment must be approved by the California State Fire Marshal. New construction or remodels shall be hard-wired with battery back-up, interconnecting all detectors so that when one alarm sounds, they all do. Finally, carbon monoxide alarms are not intended and neither suitable for fire and smoke detection. A carbon monoxide detector is a plug-in device, either battery supplied or wired to alternate current that emits a highly distinctive sound when carbon monoxide is detected. A carbon monoxide detector is not the same as a smoke detector; however, if a combination detector is being installed, it should be capable of identifying both fumes with different sounds. For all existing single-family dwelling units on or before July 1, 2011. For all other existing dwelling units, duplex/apartment/condominium complex, on or before Jan. 1, 2013. Gas appliances such as gas stove, fireplace, gas water heater, etc. 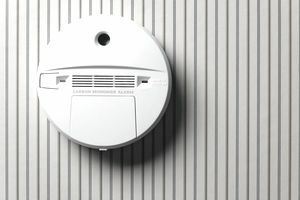 From January 1, 2013, all multi-family units will be required to install Carbon Monoxide detectors, even if the property is listed as a rental property. Information specific to the Act is found in the California Health and Safety Code Sections 13260 through 13263. See the California Health & Safety Code Sections 13261 & 17926. On a wall about five feet above from floor level. It is recommended installing the detector at least six inches from all exterior walls and at least three feet from HVAC vents. Carbon monoxide detectors can be installed on ceiling; however, wall installation is recommended. Each floor needs its own set of monoxide detectors when required by building codes. It is recommended installing carbon monoxide detectors near the sleeping area. Follow manufacturer's recommendations or follow guidelines by Standard 720 of the National Fire Protection Association. The following is a list of carbon monoxide detectors manufacturers approved by the State Fire Marshall Office. Please check the current and updated approved manufacturers for the most recent list. EDWARDS, A Division of UTC Fire & Security Americas Corporation, Inc.